Gerard Doyle was a very prominent General Secretary, as he played a part in the 1916 rising and the war of independence. He was in Croke Park playing for Dublin on Bloody Sunday when the British forces stormed the pitch. At the time he became the General Secretary the union was known as the Operative Plasterers Society and with his connections from his days fighting was able to form branches in Cork, Carlow, Leix, Mullingar, Mallow, Wexford and Clonmel among many others. He was militant in his defence of the craft as many retired plasterers would confirm today. He retired in 1973 and died in 1979. The name lives on in the union today with Brian Doyle a nephew of Gerard Doyle who is a prominent member of the National Executive Council. The members of the Limerick branch have also a long history of their militant defence of the craft and workers rights as many of the journey men of the day would have been involved in the Limerick Soviet. Our branch in Limerick is contained in the Mechanics Institute which is the only working Mechanics Institute left in the British Isles. PIC: James Cheevers, outgoing president (third from right) being presented with a plaque and a wallet of notes by James Irwin, gen. sec., at the offices of the Operative Plasterers and Allied Trade Society of Ireland. 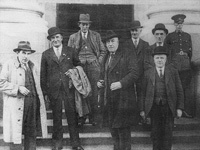 On the extreme right is Eamonn Sinclair, incoming president. Mr. Cheevers had 46 years service with the society. ONE OF Dublin's best known and best loved trade union leaders, James Cheevers, President of the Plasters' Union, retired last night after 46 years service with his union. 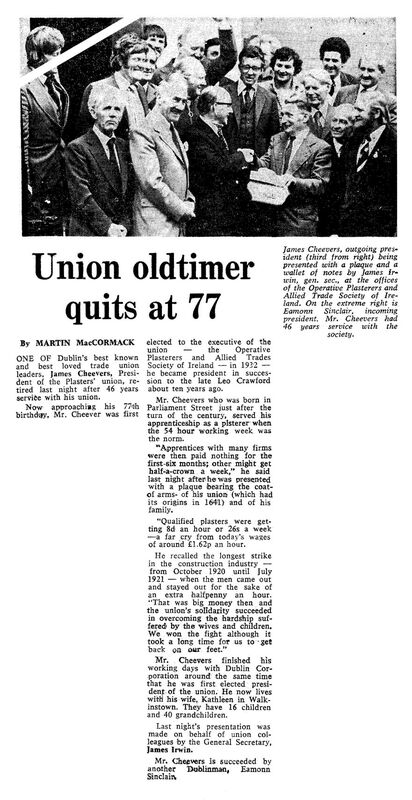 Now approaching his 77th birthday, Mr. Cheevers was first elected to the executive of the union - the Operative Plasterers and Allied Trades Society of Ireland - in 1932 - he became president in succession to the late Leo Crawford about ten years ago. Mr. Cheevers who was born in Parliament Street just after the turn of the century, served his apprenticeship as a plasterer when the 54 hour working week was the norm. "Apprentices with many firms were then paid nothing for the first six months; others might get half-a-crown a week," he said last night after he was presented with a plaque bearing the coat of arms of his union (which had its origins in 1641) and of his family. "Qualified plasterers were getting 8d an hour or 26s a week - a far cry from today's wages of around £1.62p an hour." He recalled the longest strike in the construction industry - from October 1920 until July 1921 - when the men came out and stayed out for the sake of an extra halfpenny an hour. "That was big money then and the union's solidarity succeeded in overcoming the hardship suffered by the wives and children. We won the fight although it took a long time for us to get back on our feet." Mr. Cheevers finished his working days with Dublin Corporation around the same time that he was the first elected president of the union. He now lives with his wife, Kathleen in Walkinstown. They have 16 children and 40 grandchildren. Last night's presentation was made on behalf of union colleagues by the General Secretary, James Irwin. Mr. Cheevers is succeeded by another Dublinman, Eamonn Sinclair.